In the last referendum five years prior, the Irish people were asked to give their approval to the Single European Act, which aimed to transform the European Economic Community into a single-market body by 1992. That year arrived with a new European referendum. The Maastricht Treaty had been agreed by the EEC member states, meaning that the supranational group would be re-organised around the idea of a European Union - pending ratification by each member state's parliament. The treaty also allowed for the creation and introduction of a single European currency, which was to be named the euro. 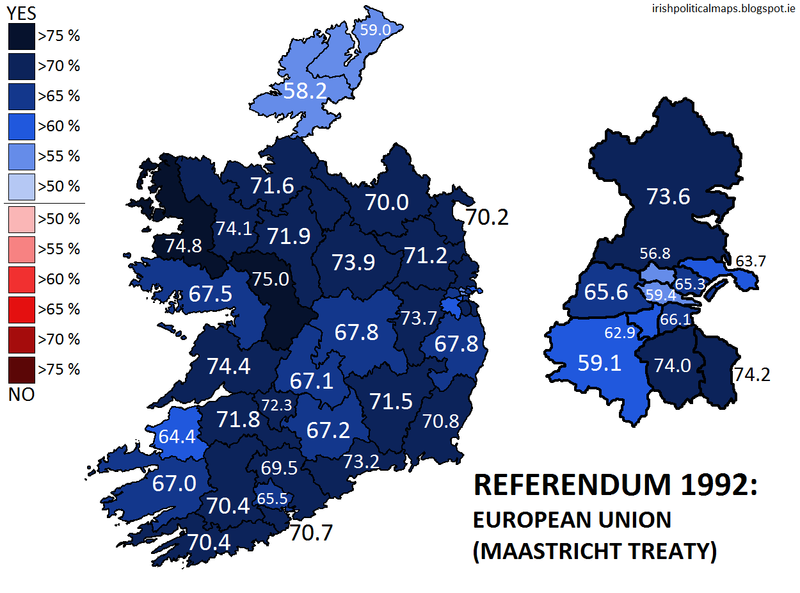 In Ireland, the debate over Maastricht took on an added dimension. The previous Haughey government had sought a guarantee that Ireland would be immune to any changes to the abortion laws of the member states if Maastricht was ratified. The new Taoiseach Albert Reynolds was anxious to ensure that the abortion issue - which was already a controversial topic in Ireland as a result of the X Case - was kept separate from discussion of the Maastricht Treaty, which the Fianna Fáil-Progressive Democrat government wished to see ratified. Fine Gael also supported that treaty, as did Labour - in contrast to their opposition to the Single European Act in 1987. The only parties to oppose the treaty was the Democratic Left and the Green Party. Democratic Left released literature featuring party leader and MEP Prionsias de Rossa making the case against Maastricht as selling out the rights of women, while also warning of Ireland being made to conform to NATO's nuclear defence policy and of the inability of either national parliaments or the European Parliament to have input on the decisions of bodies such as the European Central Bank. This criticism was echoed by the Green Party, which warned that Irish economic sovereignty could be impinged by "Brussels hold(ing) the purse strings", and that domestic industry would suffer if the treaty was ratified. Smaller groups more focused on the abortion issue also released literature, but Reynolds and his government were largely successful in their endeavour to treat abortion and the treaty as two separate issues. Reynolds planned to deal with the former in a new referendum later in the year. The results of the referendum. The colours indicate which side won in each constituency, the numbers indicate the winning figure. The turnout was a respectable 57.3%, most of which voted on the Government's side. 69% supported the Maastrict Treaty, with 31% against. Having comfortably won this referendum, the Government now had to focus its attention on the issue of abortion, but even before that, a new general election would end up occurring. It was to be a tumultuous year in Irish politics.